The decisive game of the Grand Prix Tashkent against Ruslan Ponomariov turned out to be super tense! Six hours of exhausting fight which was deciding the fate of the first place. Ruslan decided to surprise me with the Chelyabisnk variation. At the moment I can't recall any of his games played in this system with Black. We played the variant that took place in Anand - Gelfand match. As Boris has confessed he has been analyzing this variant not less than for 50 hours! Ruslan perhaps spent less time on it, because he failed to completely equalize the position in the opening. It seems to me that inaccurate was 24...Rd6: I managed to grab powerful initiative after 25.f5 and 26.g4. Ruslan should have tried 26...h6 and after he let me play 27.g5, I easily won a pawn and after his blunder on 40th move I have won another one. So, our play was mostly based on the will and after missing the winning path before the second time trouble, I understood that my opponent could draw by 62...Qf2! That was the toughest moment! Luckily, Ruslan miscalculated the variants and missed this opportunity. Later, he could raise for me more problems, however, the pawns still did their job. Mamedyarov - Ponomariov duel of Round 8 of the Grand Prix Tashkent finished unexpectidely. Ukrainian played a popular nowadays continuation 12...Nxe3 in the Queen's Gambit accepted with 3.е4. Taking on e3 has been actively analyzed starting from 2012. 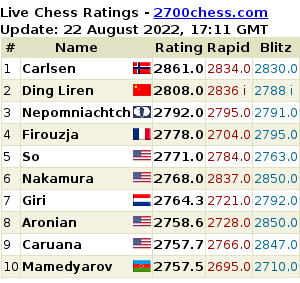 The most interesting events took place in the middlegame. Sergey Karjakin: "When I Saw the Perpetual Check, It Was Already Too Late"
Round 9 of the Grand Prix Tashkent made Sergey Karjakin the sole leader. 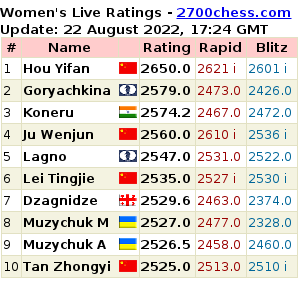 Russian GM has finished his own game against Boris Gelfand in a draw. In order to observe a thrilling action in the exchange variant of the Slav defence, the opponents at the chess board should be Alexander Morozevich and Shakhriyar Mamedyarov. The encounter of two "M"-s took place in Round 4 of the Grand Prix Tashkent. "This was a terrible game from both sides, - Grischuk evaluated his encounter against Kasimdzhanov in Round 10 of the Grand Prix London. - I spent too much time, I don't even know on what and then I started to do some stupid things like taking on d5 with the rook... I could probably finish the game before, however, after 27...Rxd5 white gained some good chances to draw. The encounter of Round 7 of the Grand Prix Tashkent between Shakhriyar Mamedyarov and Gata Kamsky went completely in American's preferable style: Slav with g6, complicated middlegame, where Black started gradually outplaying White; eventually, Mamedyarov was forced to move into a tense, however, not hopeless rook endgame.